First in a series about how VCOM is used for disaster recovery applications. After Hurricane Maria decimated Puerto Rico’s power transmission networks in September/October 2017, an Intracom VCOM partner, SkyMira LLC (Milford, CT), stepped in to quickly ramp-up communications needed for the power transmission recovery efforts. With 20 years’ experience., SkyMira quickly specified and implemented a solution. Mammoth Energy Services, Inc. (Oklahoma City, OK) assembled a team drawn from Mammoth divisions, including Cobra Acquisitions (San Juan, PR). They needed to ramp up air support for moving materials, equipment and personnel (primarily via helicopters). Using VCOM for communications interoperability, SkyMira designed a system to connect users together where there was no remaining IP infrastructure (power transmission, radio and cellular towers were destroyed). The simplified diagram below shows how this solution was implemented to enable communications between several different operating groups for coordinating day-to-day recovery operations after the loss of virtually all existing communications networks. Here is an explanation of the various sites and equipment used. “TOC” (Tactical Operations Center) is physically located inside a San Juan glass building without roof access. At TOC, SkyMira employed two CS-74 devices (Essential Trading Systems). Each CS-74 is a VCOM-compatible 4 channel device that allows operators to monitor continuously audio traffic and selectively talk back to either Field Ops or Air Ops radios and other VCOM clients. “Data Center” is located across the street from TOC and is the aggregation point for all IP fiber in/out of the island. Here SkyMira provided two Cobham Explorer MSAT G3 satellite terminals (CONUS coverage), one for field operations, the second one for air operations. A BASICS Radio Relay (called out as “RoIP Gateway” in diagram is from Vocality, a division of Cubic Mission Solutions) seamlessly connects two-way radio systems to the VCOM Matrix Intercom Network. This interface allows clients using computers, CS-74 devices or cellphones to join in radio communications without needing a radio. “Air Ops” site initially had no IP connections available due to infrastructure damage, so SkyMira employed an MSAT G3 satellite terminal to connect Air Ops to the other sites. A Vocality BASICS Radio Relay was located there for terrestrial connectivity as soon as IP was restored (the BRR has since been turned on for terrestrial IP connectivity). Field Operations used 10-20 trucks initially, now many more. For this segment, SkyMira supplied MSAT G4 satellite terminals for connecting radios to satellite service when they were out of normal RF range. SkyMira also supplied Hytera radios needed for connection of donor radios at Data Center and Air Ops to cloud-hosted VCOM server. The VCOM Virtual Matrix Server is hosted in the Intracom Cloud for connecting the local resources together into a seamless network. 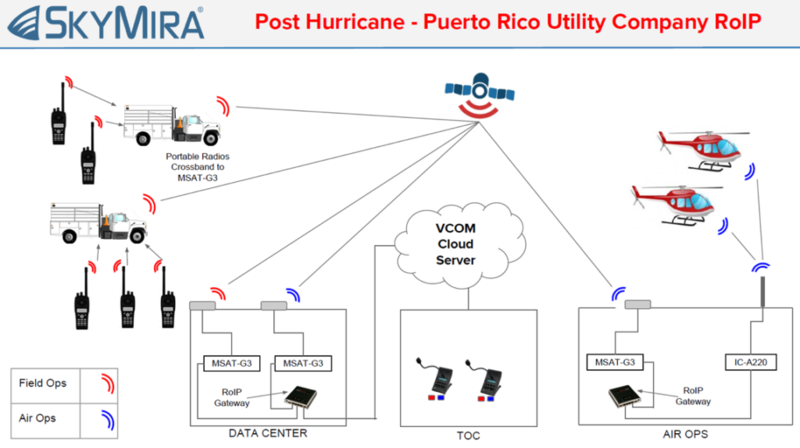 The operations in Puerto Rico needed reliable communications and the VCOM SaaS service provides the backbone to connect all the local teams together. This allows the local teams to access VCOM and Vocality connectivity without having to provision and maintain the VCOM servers. Contact Intracom Systems or SkyMira to learn more about how VCOM can be used in similar applications.